Chili is one of my favorite comfort foods and I love that this is a fun twist on the classic bean based dish, and the fact that it is super easy is a huge plus too. 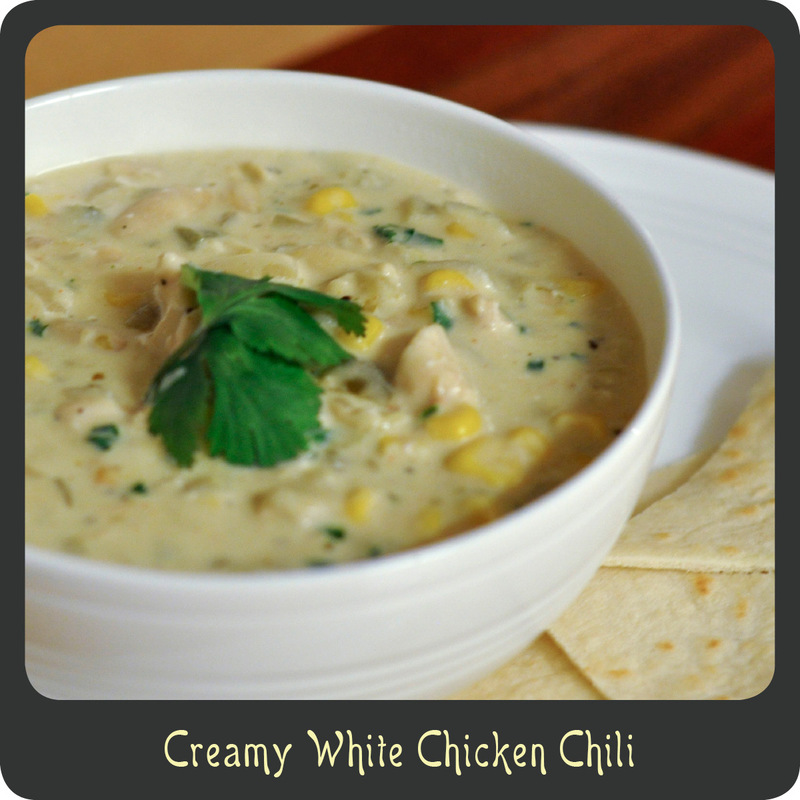 I took several different recipes I found online and mixed them all together and came up with this one for creamy white chicken chili. I think it turned out pretty darn fabulous! I used green chilies keeping it really mild so that everyone in the family would eat it but you can substitute jalapeños to give it a good kick. The mild heat is really balanced out nicely with the creaminess of the cheese and the sweetness of the corn. I served it up with some cut up tortillas on the side but a quesadilla would be great too. If you have any chili cook offs coming up give this recipe a shot. You may just get some extra points for thinking outside the box. Note: To simplify this recipe and shave off some time, pick up a rotisserie chicken at the store and skip the first four steps. You can chop it up while the veggies are cooking. Cut the chicken into bite size pieces and season with salt and pepper. Melt the butter over medium heat in a large pot or saucepan. Add the chicken and cook through stirring occasionally. Transfer the chicken to a plate and cover with foil. Heat the oil in the same pot and add the onion, bell pepper, garlic, chili powder, and oregano. Season the veggies with salt and pepper and cook for 5 minutes stirring ever minute or so. Add the green chilies and cook for another 3 minutes. Add the can of beans and all the juices, the broth, corn, and cooked chicken. Reduce heat to medium-low and add in the cream cheese. Stir the chili until the cream cheese is completely melted and smooth. Allow the chili to simmer on low for 5 minutes. Remove the pot from the stove and stir in the cilantro. Taste and add more salt and pepper if needed. Too close to lunch for me to be seeing this 🙂 Looks delicious and hearty!! I made this chili and I must say it is the best white chili I have ever eaten!! This will definitely be one I make over and over for my family. I am entering a Chili Cookoff with my sunday school class and my husband said to start bragging now because I definitely have the winner!! Thank you very much!